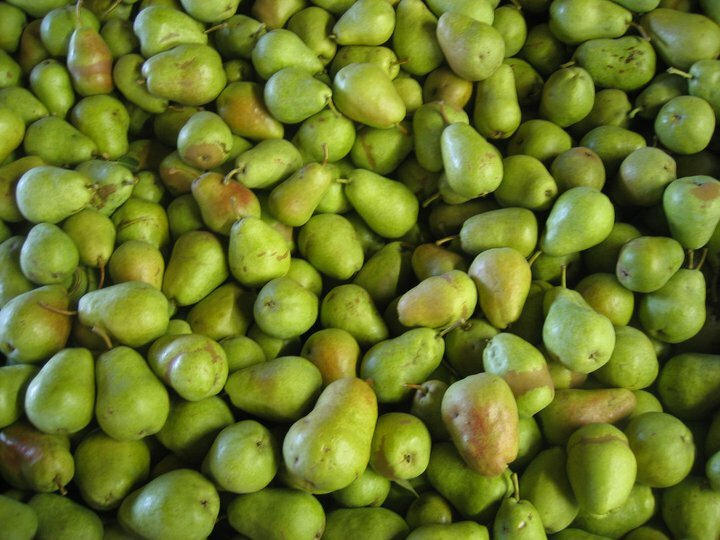 Have you ever tried to eat a properly picked and ripened pear standing up? That’s a good way to get juice on your shirt. Pears should be sweet, juicy, and succulent. We find many people say they don’t like pears, but that is because most people haven’t had one that is ripened correctly. Pears are an interesting fruit in that they should not be completely tree ripened. Pears on the tree ripen from the inside out, so when they are yellow on the tree, the center is mushy. The trick is to wait to pick them until they are starting the ripening process, then put them in cold storage for a short while. Once they are brought out of refrigeration, they will ripen evenly. The amount of time for them to ripen depends on the year, variety and when they were picked. The first pears we pick often take a week to ripen. Nearer the end of the season it may take only a few days. Many supermarket pears don’t develop their full flavor because they were picked too early – we wait until we can see their color change from hard green to a softer green and they imperceptibly start to soften. That way we know they will ripen perfectly!